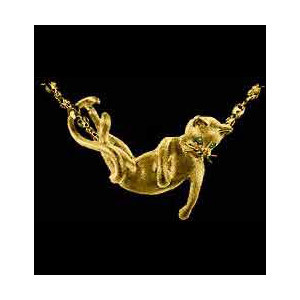 This lounging catnip kitten pendant has emerald eyes and is made of polished 14kt yellow gold. Three dimensional pendant is designed by animal sculptor Jack Slack. Made in the USA. I fully agree the other reviewer. This golden kitty is perfect in every way - from her gorgeous emerald eyes to her tiny gold whiskers! She slides freely and perfectly balanced on my 24" gold wheat chain. You will not be disappointed - this is a lifetime heirloom you can enjoy every day. This retailer is the top notch, too. I have purchased from them several times - they are always wonderful.